The Rural Telehealth Research Center (RTRC) is focused on building the evidence base for telehealth, especially in rural settings. More specifically, RTRC is charged with advancing publicly available, high quality, impartial, clinically informed, and policy-relevant research. Rigorous research is needed to identify telehealth models that are affordable and sustainable, enhance rural access, and maintain and improve quality. The goal of RTRC is to conduct and disseminate research on rural telehealth that contributes to building a high-performance system in rural America. RTRC is a collaboration of the University of Iowa, University of North Carolina-Chapel Hill, and the University of Southern Maine. RTRC is funded by the Federal Office of Rural Health Policy (FORHP) in the Health Resources & Services Administration (HRSA) http://www.hrsa.gov/ruralhealth/. RTRC is one of eight Rural Health Research Centers participating in cooperative agreements with FORHP. 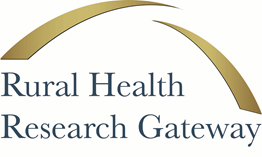 Rural Health Research Gateway https://www.ruralhealthresearch.org/, was established to provide easy and timely access to research and findings of the FORHP-funded Rural Health Research Centers, including RTRC. Its goal is to disseminate publications, policy briefs, and journal articles to users as efficiently as possible. © 2016 Rural Telehealth Research Center. All Rights Reserved. The College of Public Health, The University of Iowa | Accessibility Statement.